Spend time perfecting your swing at the Barmera Golf course, or enjoy a meal at the Barmera Hotel. Relax on the sunny shores of Lake Bonney, or join in the action water skiing, kite-surfing or learning to sail. The name Barmera came from the Aboriginal word Barmeedjie meaning Lake. The lake itself was named after Charles Bonney who saw it on the first overland trek from Sydney to Adelaide in 1838. Throughout the year, the town comes alive for many festivals and events. The Barmera Main Street Markets, open on the first Sunday of most months, are worth visiting to buy local produce, arts and crafts. In 1964, Barmera received notoriety when the world-renowned speed record breaker Donald Campbell and his dedicated team attempted to break the World Water Speed Record, reaching speeds of up to 216mph on Lake Bonney. Lake Bonney is extremely popular with yachting enthusiasts, water skiers, windsurfers and kite-surfers, as well as having some excellent safe swimming areas for the family. Canoeists and other boaters will enjoy superb fishing and sightseeing, and the adjoining wetlands abound with wildlife. FLAVOURS of the RIVERLAND home of Backyard Bread is the place to be for gourmet regional food. They offer popular handmade bread bites and a delicious range of gourmet spreads, you will find a range of flavours which proudly exhibit the region's pristine, fresh produce. The Cafe features a wide range of regional gourmet food and produce to showcase the Riverland's diverse flavours. For those after an action holiday, there’s also the beautiful Barmera Golf Course for a round of golf, a free playground and skate-park adjacent to the lake and the Barmera Playspace is a great adventure to keep the kids entertained. In June each year, the town hosts the South Australian Country Music Festival & Awards attended by country music lovers from all over Australia. Visitors can also get a country music fix throughout the year by visiting Rocky's Country Music Hall of Fame. Don't miss the "Big Guitar" and the "Hands of Fame", displaying the hand prints of famous International and Australian artists such as Slim Dusty, Smokey Dawson, Reg Lindsay and Buddy Williams, along with over 150 other noted local entertainers. Located on the north side of Lake Bonney, Napper’s Ruins was once a hotel built for former workers of Cobdogla Station. The Lake Bonney Hotel consisted of 11 rooms that included a well-stocked bar and an eating room that could cater for 12 people – this room was occasionally used as a dance space. Interpretive information is now located around the site and is an interesting place to visit. 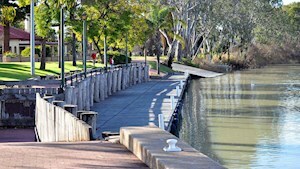 Discover the history of the town and its charming between-war architecture on the Barmera Heritage Walk – visit the Barmera Visitor Information Centre for details.